I n my high-school days, I crashed my '99 Honda CRV into a lamppost while cradling a bowl of Lucky Charms -- milk, spoon, and all -- in my lap. Fortunately, only my mini-marshmallows, pride, and front bumper were damaged. But frankly, I should have been arrested. Or at least harshly fined. Lisa Robinson, senior program manager at the National Safety Council -- a nonprofit that advises businesses and organizations about all-things safety -- has committed much of her professional life to fighting distracted driving. She said that accidents caused by food and drink, specifically, are devastatingly overlooked in her line of work when compared to other distractions like texting. "Just a couple weeks ago I spoke with a man who completely totaled his pickup truck because the styrofoam bottom of his ice-tea cup was about to break," she said. "He took both hands off the wheel, his eyes off the road, and he ended up hitting the cars in front of him going 70 mph." It happens all the time. While texting and driving has (deservedly) become the most volatile issue regarding distracted driving in the 21st century, eating while driving -- a practice as old as automobiles themselves -- has been ignored at best, and generally accepted as "normal" at worst. Eating while driving has been ignored at best, and generally accepted as "normal" at worst. The truth: Eating behind the wheel has proven to be just as dangerous as texting. If you've spent considerable time operating a motor vehicle, you've probably been distracted by drinking or eating at some point. An EXXON-Mobile survey of 1,000 individuals claims 70% of drivers have admitted to eating while driving, and 80% admitted to drinking non-alcoholic beverages on the road. Currently, ingesting while driving exists in a legal gray area: There is no legislation that explicitly and specifically bans it. I don't mean to sound like a stickler, or an overbearing mom after watching a hard-hitting 60 Minutes exposé, but eating and drinking in the driver's seat is way more dangerous than you probably think. After my own cereal-induced collision, I vowed I'd never eat while driving ever again. According to the experts, you should do the same. During his 25-year stint as a police officer in Red Bank, New Jersey, Michael Furlong saw all conceivable varieties of distractions impairing motorists, from people putting on makeup and brushing their teeth during the morning commute to someone using two phones at the same time like a mobile Jerry Maguire. He's also seen the negative effects of eating and driving firsthand. "This was something we'd see all the time on patrol," Furlong said. "Sometimes we'd pull someone over because they were driving crazy, maybe thinking they were intoxicated or something... but really, when we start talking to them, we figure out they were just distracted by their food. That they spilled their coffee, or dropped a French fry and went down to pick it up. It's not uncommon by any means, and easy to tell when they have ketchup all over their faces." From Furlong's perspective, distracted driving is distracted driving, period. Whether it's a text, a hairbrush, or a rack of lamb taking your focus away from the road is irrelevant. Danger doesn't really distinguish. "How is eating or drinking while driving different than texting?" Robinson asked. "You still have at least one hand off the wheel, your eyes are still wandering around the car, your brain's attention is still being diverted away from the road. Even one millisecond of inattention can cause a crash." Distracted driving -- which entails eating and drinking, of course -- is responsible for over 80% of all car crashes. The National Highway Safety Organization estimates that distracted driving -- which entails eating and drinking, of course -- is responsible for over 80% of all car crashes, though it's unclear how much of that is directly influenced by food and drink alone. But a crash from food is exactly the same as a crash from any other form of distracted driving -- which took the lives of 3,477 people in 2015 alone, when comprehensive data was last collected. Orthopedic trauma surgeon Dr. Lisa Cannada sees victims of distracted driving cases in her St. Louis-based practice every day. As a medical expert and spokesperson for Decide to Drive -- a public-service campaign bent on eliminating all forms of distracted driving -- she's certainly familiar with the dangers of eating while driving. "Even a crash at low-speeds, 20 mph and slower, can have long-lasting, permanent health effects," Cannada said. "Chronic neck, back, and head problems are common injuries from lower-energy crashes, so even fender benders can be major. I think a lot of people might justify snacking or sipping their coffee in traffic when they aren't going that fast. But even distraction during that period can be so dangerous for motorists." One of Decide to Drive's major initiatives at the moment is raising awareness about eating while driving, as it's such a deadly (and overlooked) component of distracted driving. The public serving group even features a series of PSAs on its site with the hashtag "No Small Distractions" calling out drinking coffee and eating fries, specifically. "Really, the only way to curb this problem, is to just not eat or drink while driving at all," Cannada said. "The problem is, it's incredibly hard to enforce... almost impossible, really." Eating while driving isn't against the law, at least not specifically. But in many places, it's also not entirely legal. 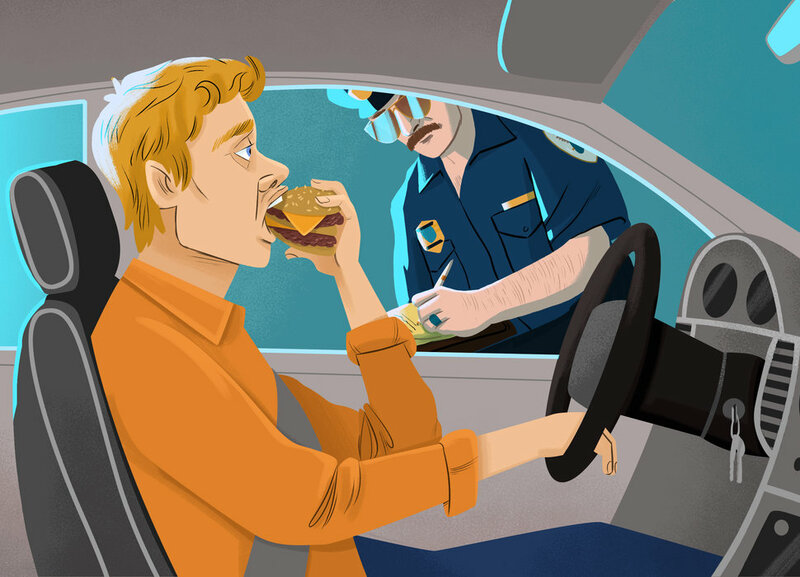 The most widely publicized case of an individual actually getting in legal trouble for eating while driving happened in Atlanta in 2015, when a motorist was ticketed under the general offense of "Driver Exercise Due Care," (meaning, he didn't exercise due care). As this minor traffic infraction warranted a national write-up by The New York Times, its controversial nature was clear: Many people (including the driver in question) saw nothing wrong with eating behind the wheel. "Currently, many states have distracted-driving laws in place along with reckless driving statutes," said Kara Macek, director of communications for the Governors Highway Safety Association, a nationwide non-profit with representatives in every state. "But the broader the law is, the more room for discretion for individual law enforcement. People have been eating and driving since the inception of driving. I'm definitely not trying to downplay the effects, or the dangers, but it has become somewhat normalized, and probably isn't a focus for police as much as other things on the spectrum like texting." Macek makes a good point. Legislation on distracted driving laws rarely (if ever) singles out specific elements, leaving much of the distinctions to individual officers. There is no federal, sweeping ban on distracted driving, even when it comes to texting. But nearly every state has some type of ban on using handheld electronics while operating a motor vehicle, with varying specifics. For example, you can drive the length of Pennsylvania using one hand to hold a phone to your ear (though texting is banned), but once you cross the NJ border, operating a phone that isn't hands-free is illegal, so you might have to hang up on Grandma once you cross the Delaware River. Still, there is no state with explicit laws against eating while driving. And all proposals that even broach the topic -- such as a recent pushes from Washington's legislature and New Jersey lawmakers to specifically identify the different aspects of "distracted" to include food within their own states -- are often met with extreme pushback from the public. Nothing has officially passed, though, technically you could face still face consequences from eating and drinking in the driver's seat, depending on the circumstance. "Would I pull someone over if they have some French fries in their hands? No. But if someone is eating a sub, swerving all over the road? For sure. And I have." "It is a tough call," Officer Furlong said. "And I think at the end of the day it really comes down to the specific situations. Would I pull someone over if they have some French fries in their hands? No. But if someone is eating a sub, swerving all over the road, and endangering other people? For sure. And I have." Furlong did note that he would classify the kind of behavior listed above as "reckless" rather than "distracted" driving, which actually carries a much harsher penalty. But the punishment could still be up in the air. "This is the kind of thing that is extremely difficult to prove in court. You don't have a breathalyzer or a log of texts to rely on as evidence. All the person would have to say is that they weren't eating, and it kind of becomes the officer's job to either push the issue or not," he said. So ultimately, you probably don't have to hide your meatball sub or Big Gulp below the dash when driving by a cop... yet. But just because you won't necessarily get pinched for something doesn't make it right. Or safe. "Driving is dangerous already. And it's extremely dangerous when people on the road aren't paying attention," Robinson said. "Any form of distraction has been literally proven to reduce your reaction speed to levels that make driving dangerous. I understand that people think it's OK to eat and drive, or drink coffee and drive, just because it so normalized. But people also have to realize that this is a major, major risk, that is almost always overlooked and treated as 'no big deal.' At the end of the day you need to ask yourself: Is this really worth it?" If the words of these experts, the consistently proven data, or the (still-maimed) bumper of my '99 Honda CRV mean anything -- it's not. Every day, eight people are killed by distracted drivers. Those are eight souls that perish because someone was trying to multitask while operating a multi-ton vehicle. There is nothing in the world that is too important to wait, whether it's sending an expertly timed poop emoji to a raucous group chat or slamming down a slice of Buffalo chicken pizza. So what's the difference between the two? If lawmakers crack down solely on texting, they are still leaving lives on the table that don't need to be lost. The increasing stigma behind texting while driving needs to expanded to all forms of distractions, legally and socially, too. 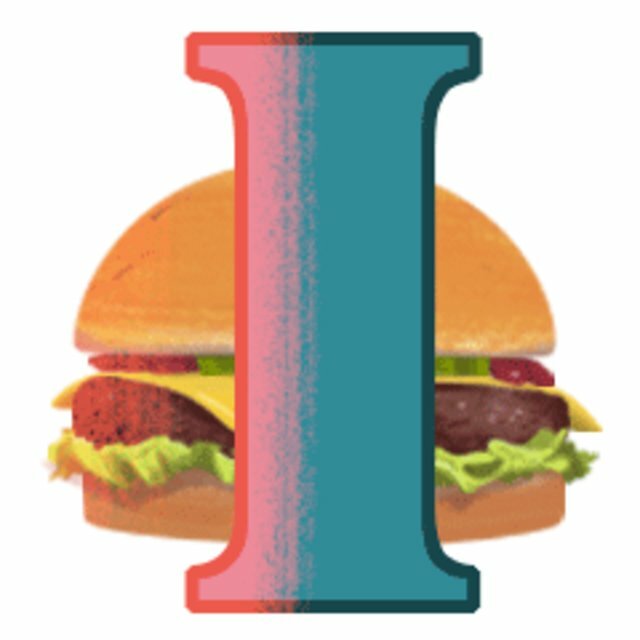 Shame your burger-chowing mobile friends. Stink-eye the dude in the fast lane juggling coffee and donuts. Hand-feed your pal some grapes while riding shotgun, awkwardness be damned. The most crucial point here isn't whether eating/drinking while driving should ultimately be illegal. We should really be asking ourselves how the hell it isn't illegal, already. How many more ruined lives will it take to change our minds? Wil Fulton is a staff writer for Thrillist. He doesn't blame the Lucky Charms. Follow him @wilfulton.